Giveaway! $50 Disney Gift Card - Just in time for Valentine's Day! | Focused on the Magic : Giveaway! $50 Disney Gift Card - Just in time for Valentine's Day! Giveaway! $50 Disney Gift Card - Just in time for Valentine's Day! We're ready to let it go and have another giveaway! We've teamed up with a group of blogging friends to offer you a fabulous Frozen themed $50 Disney Gift Card just in time for your Valentine's Day shopping. 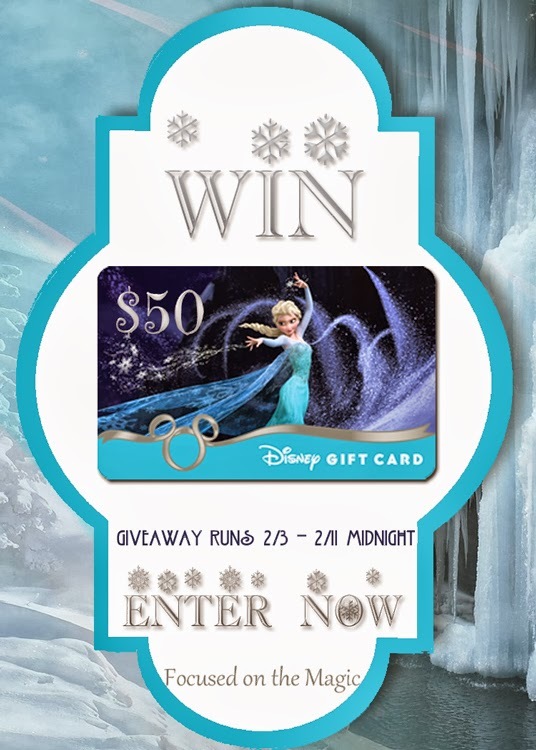 One lucky reader will win one for $50 Disney Gift Card! The giveaway will run from Monday, February 3, 2014 until Monday, February 11th, 2014 at 11:59PM EST.